The 41st century is a pretty grim place, all said and told. The Imperium of Man is in a stagnant decline and beset by enemies on all sides. There are the shady Eldar, the even shadier Dark Eldar, and Ork hordes ravaging the spacelanes. Chaos Gods lurk in the warp, Tyrannid Hive Fleets threaten to devour the entire galaxy and all the tanks and spaceships are now made from plastic. Also an Ork sits upon the Golden Throne of Man. ...Or is it? The truth can never be heresey! The God Emperor of Man is in fact an Ork, raised to the highest level. The evidence for this is actually extremely compelling. They are unlike Orks in fantasy fiction, simply a green-skinned race. No, Orks in Warhammer 40k are more akin to a spore, designed by ancient gods for an even more ancient war. Orks can generate on any planet where their spore lands, and create vast empires based on the strength of their belief. Ork technology works via their combined psychic field which turns belief into reality - if an Ork builds what looks like a fast car, it will drive fast. If they paint red stripes on it, it will go even faster! They can build deadly rocket launchers out of cardboard tubes and poster paint if they believe it is a deadly rocket launcher. Orks gravitate towards the toughest Ork, who becomes their leader, and gains power due to the Ork's belief in them. This creates a 'WAARGH!' which is the Ork equivalent of a crusade where they follow their leader into travelling out into space in homemade rocket ships and murdering stuff. Humans are weak puny hairless ape things. Some of them have psychic powers though this is nowhere near the ability of other races. They rely on technology and genetic engineering to bolster their forces. How does the God Emperor work? The God Emperor of Man was created millennia ago when a group of powerful psychic shaman on Earth all committed suicide simultaneously with the plan to be reborn as one entity, the God Emperor. He has guided mankind for all its history and been behind all key events. He led mankind through the great age of technology, much of which is now lost. He designed and powered the necronomicon which enables humanity to use the warp to travel space. Currently his body is ravaged and he sits upon the Golden Throne, kept alive by the psychic powers and sacrifice of millions of human psychics. As can be seen, the God Emperor sounds much more like an Ork. His power is immense, but his existence and power is powered by the psychic powers of other, and the feverent belief in him by the billions of human subjects in the galaxy. When his power was at its height, technology was far better - was he using his Ork powers to bolster the effectiveness of human tech? Can it be a coincidence that technology decays along with his body? The God Emperor can do things that no other human can - he found a way to tame the warp and is at the level of gods. His existence is down to the power of belief. If an Ork had an entire civilisation pouring their belief into them, would they be a god? Yes, yes they would. 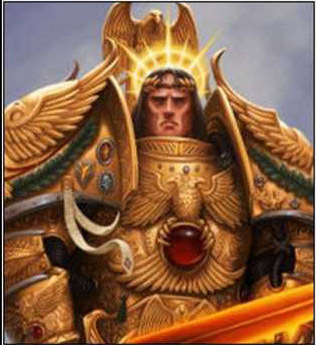 And their name would be the God Emperor of Mankind. Could the Emperor actually be Gork and Mork? Could it be that, when the shamans created the Emperor, they unknowingly made a mistake? Maybe the new being was somehow schizophrenic, creating the two beings of Gork and Mork, the Ork gods, as separate personalities within itself. After all, looking at all we know of the Emperor, he was definitely BOTH brutally cunning AND cunningly brutal! Crazy stuff, I know, but it doesn't really sound impossible if you think about it! !